Clinic Management System compose of all process that is required to operate the clinic in order to improve the efficiency. 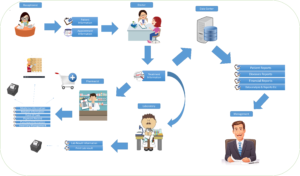 Managing important information in Electronic Medical Record (EMR) such as patient information, booking, diagnosis result, health care history, medical bill etc. Hospital Information System (HIS) focus mainly on administration needs of the hospitals. Fully integrated HIS allow the user to manage all aspects of the hospital’s operation, such as medical, administrative, financial, and legal issues and the corresponding processing of services. The following are some of the fetaures of the system. Deatiled patient record is maintained in the system where genetic information , appointment history , life style details , lab test details etc of the patient is maintained. The record for families is created . All teh memebers belonging to one family are maintained in one family record. Appointments can be created for the patients. The appointments can also be seen in Calender format. Medicines can be prescribed and prints of prescriptions can also be taken . Laboratory tests can be performed and the results can be saved in the system for future reference. Invoices acn be created for prescriptions , appointments and also for lab tests. These invoices are connected with Accounts module of Openerp. Thus , the invoices created have effect on balance sheet. To do any other billing , other than appointment fee , prescription fee or lab test fee , Medical service option can be used to create invoices. a. Appointment Evaluation per doctor. © Infinite Business Solution | Enterprise Resource Planning (Odoo/openERP) Service Provider 2019. Brilliance theme by CPOThemes.